If your budget will allow, there's no better salon hair dryer than the Dyson Supersonic. But for those on a budget, the Rusk W8Less is a great second choice. 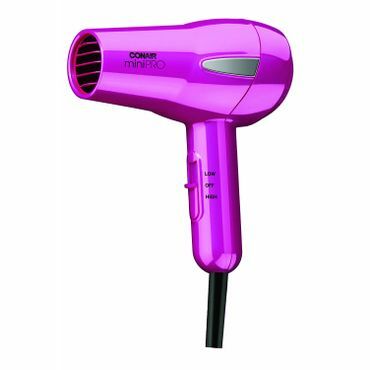 Among inexpensive hair dryers, for home or on the road, Conair reigns supreme. It's undoubtedly expensive, but many professional stylists and home users say the Dyson Supersonic is well worth its high price. Its fast-spinning motor, built into the handle, delivers gale-force airflow of over 60 mph, drying hair in record time – yet it's actually quieter than most hair dryers. It also boasts a wide array of heat and speed settings and unique magnetic attachments that are easier to rotate and remove. And most users love its results. 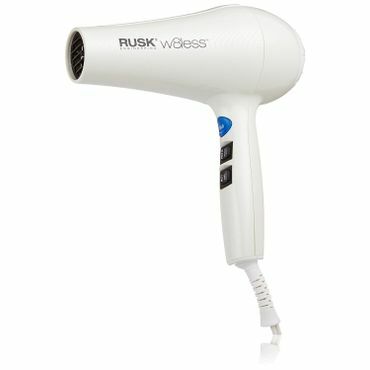 For those who want a salon hair dryer but don't want to shell out $400 for it, the RUSK Engineering W8Less Professional 2000 Watt Dryer provides all the key features at a more reasonable cost. Though it weighs less than a pound, it packs a 2,000-watt motor, ionic technology, five heat and speed settings, and a cool shot. Professionals and users say it dries hair quickly, leaving it sleek, shiny, and frizz-free. No hair dryer under $50 gets better reviews than the Infiniti Pro by Conair 259. This 1,875 watt hair dryer has many of the features you'd find on a pricier salon model: ionic technology, independent speed and heat settings, a cold shot button, and a 4-year warranty. While it's slow at drying in expert tests, users say it works quickly under real-life conditions. Its biggest drawbacks are its noise level and hefty weight. The Conair 245HP MiniPRO Tourmaline Ceramic Styler packs a surprising punch for its size. Though it weighs just over half a pound and has a 1,200-watt motor, consumers say it dries hair quickly and quietly, leaving it sleek and smooth. Its small size, dual-voltage switch, and carrying case make it easy to travel with. However, it lacks features found on full-sized dryers, like a cool shot button and separate heat and speed settings. Salon hair dryers are the tools the professionals use. This means they have all the features needed to deliver salon-quality results: high wattage, multiple heat and speed settings, ceramic and tourmaline heating units, and ionic technology. Not every home user needs that many bells and whistles, but salon hair dryers have other pluses as well. They're often lighter and quieter than cheaper hair dryers, and they typically have better warranties and service. The downside of these models, of course, is their high price—anywhere from $75 to $400 or more. But when you compare that to the cost of a weekly trip to the salon, it starts to look a lot more reasonable. Budget-priced hair dryers don't offer the same variety of settings and special features found on salon dryers, but they provide the basics: adjustable heat and airflow, ceramic and ionic technology, and a cold shot button to set a style. They're not as fast or as versatile as salon dryers, but they get the job done. Expect to pay $75 or less. When you're traveling, every inch of suitcase space and every ounce of weight matters. The ideal hair dryer to take with you is as small and light as possible—preferably with a fold-up handle to fit into an even smaller space. However, there are tradeoffs to consider, as hair dryers this small are liable to be underpowered and somewhat flimsy. Most are relatively inexpensive, however -- our Best Reviewed selection costs less than $25. Ceramic is a composite material usually made of clay, just like the tiles on a bathroom floor. It can be used on the body of a hair dryer, the heating element, or other internal parts. This material heats up quickly and radiates it evenly across its surface. Dermatologists interviewed by TheSweethome.com say this more even heat is better for your hair, but engineers interviewed in the same article doubt it really makes a difference. They point out that hair dryers don't transfer heat by radiation; they do it with blowing air, so radiant heat shouldn't matter. In any case, nearly all hair dryers these days have ceramic-coated coils, so the word "ceramic" on the package doesn't mean you're getting anything extra. Ionic technology produces negatively charged ions – that is, atoms with an extra electron or two. These, in theory, help break up positively charged water droplets into smaller droplets. Stylists claim negative ions speed up drying and can also help tame frizz, as the tinier water droplets are less likely to soak into the hair shaft. However, they say this can actually be a downside if your hair lacks volume. The engineers at TheSweethome.com are skeptical about ionic technology, arguing that the only way it can really control frizz is by reducing static, which you an also do with a smoothing cream. Testers at TheSweethome.com ran the same hair dryer with its ionic feature switched on and off, and they found no difference in performance. Tourmaline is a naturally occurring, semi-precious mineral that produces negative ions when heated. Crushing tourmaline into a powder and coating the dryer's components with it boosts its ionic output – but it also boosts the price, since tourmaline is a rare and pricey stone. And, as TheSweethome.com points out, a hair dryer that says "tourmaline" on the box may not contain very much of the gemstone, so there's no guarantee you're getting what you pay for. So, if ceramic, ionic, and tourmaline technology don't matter very much, what does? Well, for a start, a hair dryer has to produce enough heat and airflow to dry your tresses quickly. However, you don't need tremendous wattage to get good airflow. 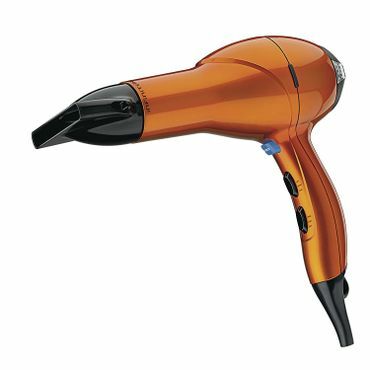 According to most experts, any hair dryer with at least 1,800 watts of power can get the job done. Just because a hair dryer is capable of running hot and fast, however, doesn't mean it always should. Hairstylist Josue Perez says in a Huffington Post interview that high heat is best for thick or coarse hair, while fine or delicate hair needs low heat to avoid damage. It's also important to use low heat when the hair is only slightly damp to avoid over-drying, which can fry your locks. Most hair dryers have at least two heat settings, but not all have separate controls for speed and heat, which are important if you want to be able to create a variety of styles. Experts also recommend a cool-shot button for setting a style and preserving shine. With the exception of cheap travel dryers, nearly all hair dryers have all these key features. Where they differ is in ease of use. A hair dryer needs to be light enough and comfortable enough to hold up for several minutes at a time while styling, and not so loud that it deafens you. It's also helpful to have buttons that are conveniently placed, so you can find them easily but avoid hitting them accidentally. And little touches like a longer cord and a removable filter add convenience. "The Best Hair Dryers to Invest in, According to the Pros"
"The 12 Best Blow-Dryers Money Can Buy"
To choose the best hair dryers, we focused mainly on how quickly each dryer works and how good it leaves hair looking when it's done. We also considered ease of use, weight, noise level, and durability. We looked at how hair dryers performed in professional comparison tests at TheSweethome.com and Good Housekeeping, recommendations from professional stylists in fashion magazines like Vogue and Allure, and reviews from ordinary users on sites like Amazon.com, Ulta.com, and TotalBeauty.com. In September 2016, Dyson – known for its top-of-the top-end vacuum cleaners and fans – released its first-ever hair dryer. Although the Dyson Supersonic (Est. $400) has been on the market for less than a year, it's already "making waves" in the world of fashion and beauty. Pretty much every style publication to release a list of the best hair dryers – including Allure, Vogue, and Harper's Bazaar – includes the Dyson at or near the top, with rave reviews for its innovative design and powerful airflow. The Dyson Supersonic doesn't look like any other hair dryer. Where most dryers have the motor built into the head of the dryer, Dyson puts it in the handle, which is thicker and heavier as a result. Its 13 fast-spinning blades pull air through a fine mesh grid on the lower end of the handle, then directs it out through a ring-shaped aperture at the upper end. Reviewers say this design delivers powerful airflow with less noise. In tests at Good Housekeeping, the Dyson moved more air than any other hair dryer, and Shannon Palus of TheSweethome.com, which ran the most thorough test of hair dryers we've seen, says it "maxed out our weather meter" at 60 mph. The Dyson boasts some other unique features as well. A thermal sensor built into the ring measures the temperature of the exiting air 20 times per second, constantly adjusting it so it won't fry your hair. It has four heat settings, including "constant cold," and three speed settings – fast, regular, and gentle. And the concentrator and diffuser attachments, rather than screwing on to the nozzle, are attached with magnets, making them easier to rotate or remove in the middle of a styling session. Yet despite all these benefits, making the Dyson Supersonic our Best Reviewed pick among salon-grade dryers was a tough call. That's because its performance in professional comparison tests, and the reviews it gets from users, aren't as uniformly positive as we'd expect for a hair dryer at this price point. Good Housekeeping awards it 4.5 stars out of 5, saying it dries hair in record time and has an "elegant and original" design. However, Palus is much less impressed. She notes that while the body of the Dyson dryer weighs only 1.1 pounds, its heavy and bulky cord makes it tiring to use, and its super-fast airflow tangles hair easily. She also finds the thicker handle harder to hold and the controls on the back of the dryer's head awkward to reach. And to cap it all off, she doesn't think the Dyson makes her hair looks any different from any other blow dryer. 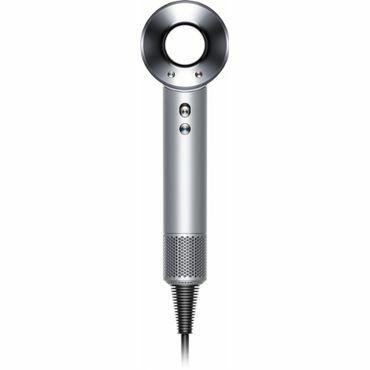 What tips the balance is that we found hundreds of reviews for the Dyson Supersonic from users on BestBuy.com, Ulta.com and elsewhere, and the majority of them love this dryer – passionately. It earns a 4.7 star rating at BestBuy.com based on nearly 550 reviews, and a 4.8 star rating at Ulta.com based on nearly 900 reviews. Most rave that the Dyson is powerful and lightweight, cuts down their drying time significantly, and leaves their hair smooth, silky, and shiny. We did see worse feedback at Amazon.com, however, but it's worth noting that the hair dryer is only sold by third party sellers there and is pricier than if bought elsewhere. In addition, it appears that some people received "gray market" products -- items produced for other countries and not intended for sale in the U.S. If you're looking for high-quality alternative to the Dyson, the Harry Josh Pro Tools 2000 Pro Dryer (Est. $250), our Best Reviewed pick from last year, is still worth considering. Though still pretty pricey in its own right, this 1,875-watt dryer is less expensive than the Dyson yet is packed with distinctive features. It includes an extra-wide nozzle; a patented curved handle for extra comfort; a motor that's guaranteed to last 2,000 hours; a dual-filtration system that cuts energy use by as much as 70 percent; and a choice of eight heat, speed, and ion settings. One feature that particularly impresses the editors at Allure magazine is its ability to toggle between ionic drying for sleeker styles and non-ionic drying for more volume. And its cheery mint-green color gives it a unique look that users love. The Harry Josh Pro Tools 2000 is an editors' pick at Allure magazine, Harper's Bazaar, and Vogue, and it gets a big thumbs-up from a staffer at Refinery29.com, who says it was "seriously magic" on her long, thick tresses. However, this hair dryer has its detractors as well. Palus says the Harry Josh is a "genuinely nice" dryer with a compact shape and convenient button placement, but "not the superior hair experience that it claims to be." When she tested it at home, she found her hair dried no faster and looked no better than with any other hair dryer. And at 1.2 pounds, it was a bit heavier than other hair dryers in this comparison. Similarly, Good Housekeeping awards the Harry Josh a good but not great rating of 4 stars out of 5, saying it's fast and powerful, but also heavy and loud. Also, some of its testers complain that even its lowest setting feels "scalding hot." Owner reviews for the Harry Josh Pro Tools 2000 are mostly positive, but not uniformly so. At Dermstore.com, where it's primarily sold, it earns an overall rating of 4 stars out of 5 from nearly 300 users, many of whom say this dryer has turned styling their hair from a chore into a treat. Reviewers at TotalBeauty.com give it 8.8 stars out of 10, making it the third most popular dryer on the site. Most owners say this dryer is seriously powerful – many go so far as to claim that it literally cut their drying time in half. Many also say it leaves hair looking amazingly smooth, soft, shiny, and healthy, allowing them to cut way down on the use of flatirons and other post-styling aids. They also say its compact size makes it a good choice for travel. However, we also saw a few complaints that the dryer isn't nearly as durable as you would expect for the price. Problems include flaking finish, damaged handles, and failed motors. Although the hair dryer is covered by a 2-year warranty, the user is responsible for shipping costs, plus a $10 handling fee. And if the back cover or screen breaks after the warranty is up, there's no way to replace it; you have to shell out another $250 to replace the whole unit. While the $250 Harry Josh dryer looks like a bargain next to the super-pricey Dyson, it's still awfully expensive by most people's standards. If you're looking for a hair dryer with salon-quality features at a more reasonable price, your best choice is the RUSK Engineering W8Less Professional 2000 Watt Dryer (Est. $100). It weighs less than 1 pound, yet its 2,000-watt motor produces powerful airflow and heat. There are three heat settings and two speed settings to choose from, which is a good thing since the top settings could be too strong for many users. A staffer at Refinery29.com found that she had to turn the dial down from "hot" to "warm" for comfort, and the drying speed was almost too fast to give her enough time for styling her bangs. This Rusk hair dryer has received more than 1,900 reviews at Amazon.com and Ulta.com, with ratings of around 4.3 stars out of 5 across the two sites. Users describe the dryer as incredibly powerful and lightweight, and they love its multiple settings. Most owners claim it leaves their hair smooth, shiny, and frizz-free. Some users find the placement of the controls awkward, but others say it's standard for a salon dryer and easy to adjust to. We also saw a smattering of durability complaints. The Rusk dryer comes with a 2-year warranty, but it requires the user to return the dryer to a service center and cover return shipping costs (plus a $3 handling fee).